Thank you for your purchase of the EFILive AutoCal from Black Bear Performance. Before we get started, there are a few things to note about the AutoCal device. Want to Tune an additional vehicle? Each AutoCal ships with licensing for one vehicle only. Up to 221 vehicles can be tuned with each device, however additional licenses will be needed. Please contact us for details. Six MB of onboard memory exists on the AutoCal. Each tune file can take anywhere from .5 to 2MB of data, depending on vehicle and controller type. We will do our best to provide tune files as quickly as possible. If you have not heard back from us within 2-3 business days, it is possible that your email was trapped by a spam filter, please email again in a different email chain. Periodically, software and hardware (firmware) updates may be necessary for the best user experience. We encourage installing the EFILive Auto Update utility to be able to stay on top of this easily. Before your AutoCal can be used to tune your truck, software must first be installed on your PC and folder created to store your tune files. Step 1: Create a folder on your computer for tuning files. We encourage you to create a separate folder, either in your documents, desktop, or wherever you prefer, so as to be able to keep all of your tuning files in a central location. To do this, navigate to your desired location, right click on an open area and select "New Folder". Name the folder "Tuning Files" and press enter. 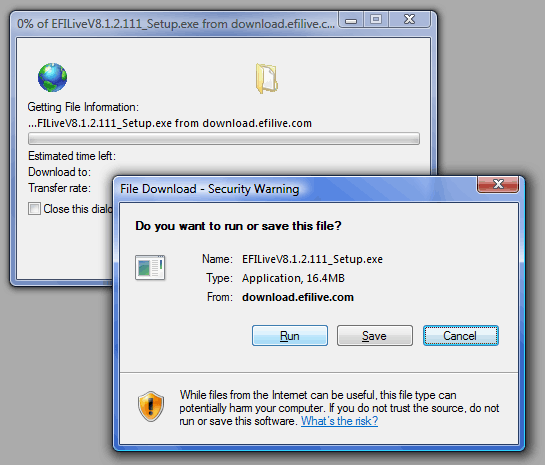 Step 2: Install EFILive software on your desktop or laptop computer. 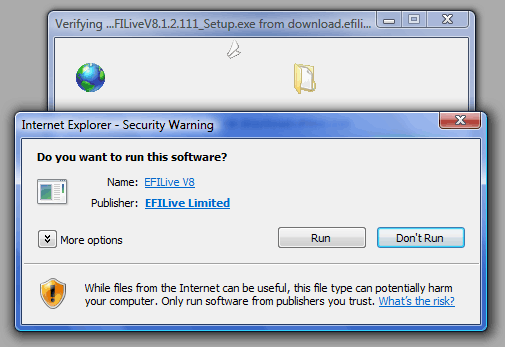 It will be necessary to download and install EFILive V8 software to manage your AutoCal. Please select the most recent version available at the link HERE. When prompted, choose to Run and install the file after downloading. Follow the on-screen installation instructions and when complete, choose to launch the program file. Install the software to the default location -- DO NOT ALTER THE SOFTWARE INSTALLATION. Step 3: Update AutoCal hardware (firmware) to latest version. Connect the AutoCal to your PC and then open the Scan and Tune program. Most AutoCals are shipped pre-configured for the vehicle that it is ordered. If you have received an AutoCal that is not configured for your vehicle or you need to change configuration for a different vehicle type, please see those instructions below or skip ahead to the data collection instructions. Each vehicle type uses a different set of configuration options that we have defined for data collection. Please find your vehicle type below and click on the download icon immediately next to it. A single "Quick Setup" file will download to your computer. 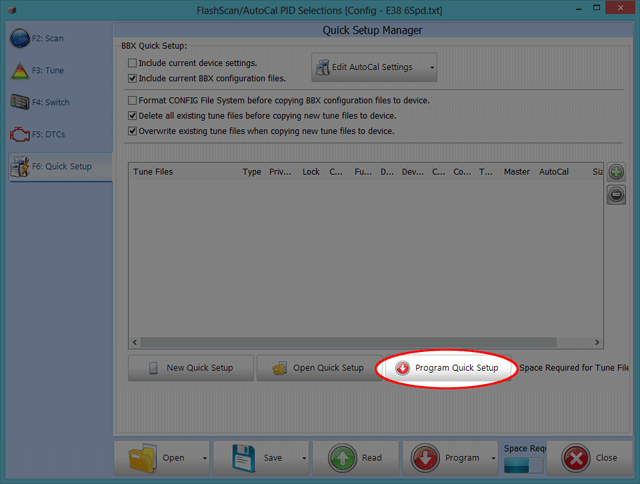 Open that file and click on the "Program Quick Setup" button to update your AutoCal Configuration. For all other vehicles or if you are not sure which configuration to utilize, please Contact Us. We have configurations available and will be happy to help. Your AutoCal is now ready to retrieve your factory tune file(s) and collect data for your tune. For the complete tune process, we will need for you to send in two different types of files collected from your vehicle, a data log and the stock tune file(s). The first that you should collect is a Data Log. The Data Log is collected while the engine is running and you are driving the vehicle. The AutoCal will be plugged into the OBD2 port under the dash during this process and no laptop is needed. The second type is the OEM Tune file(s). This type of file is gathered while the vehicle is in Park, the ignition turned to the Run position, and the engine off. Data logging should be completed by all AutoCal users except those that need an initial tune to be able to get the vehicle drivable. 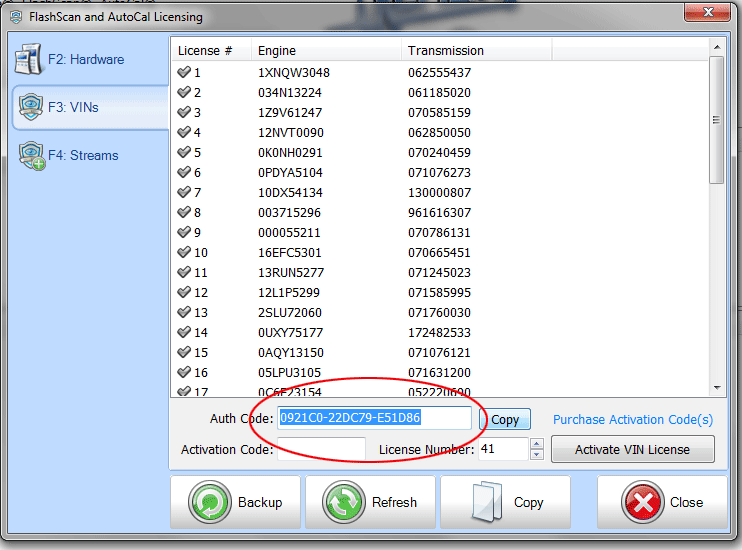 All AutoCal users must provide their OEM Tune file(s). For the purpose of collecting an initial log file for tuning, we advise collecting at least 20-30 minutes of driving with varying rates of acceleration and speed. Full throttle operation is required for at least 3-4 second bursts to high RPM, even if you never drive that way. The only exception to that requirement is if modifications to the vehicle make it unsafe to run at full throttle without further tuning. While logging, please be cautious and aware of your surroundings and do not perform any driving maneuver that you would otherwise deem as unsafe or of questionable legal nature. Connect your AutoCal to the provided OBD-II cable and locate the OBD-II port under your dash. Connect the cable to the OBD-II port and observe that the unit powers up. If no power is found, turn your ignition key to run and observe again. If still no power is found, check your cigarette lighter fuse in the underhood fuse panel. Using the Next and Prev buttons, navigate to the controller type that corresponds to your vehicle type and press Ok to begin data-logging. This will start the recording. In nearly all cases, the first option to appear is the correct one to choose. If the log file begins recording immediately, then there is only one option available. Please see below for controller types if you are unsure. After you are done driving, with the engine still running, hit the Prev button until you see Exit and then hit OK. It should say Saving and then Saved. You can turn the engine off. To Pause your recording, press the Ok button at any time. To resume, press the Ok button again. (This option is not recommend. It would be better to just finish the log and save it. To Save your log file, press the Prev button until you reach the Exit screen and then press Ok. It will say Saving and then Saved. Once you see Saved, this confirms that the log file has completed. Note: The AutoCal has 6MB of onboard memory. If you have multiple tune files loaded on the device, you may end up with limited space available for log file creation. You may free up this space by navigating to the "Format File Sys" option or by using the EFILive Explorer (outlined in the file copying section). We do not advise you to monitor any parameters directly while driving, log files may be viewed on your PC using the EFILive Scan tool, downloadable from www.efilive.com (V7.5.x). Turn your ignition key to the run position, but do not start the vehicle. Generally, this is two clicks forward. On vehicles with push-button start, you'll need to press the Acc button. Using the AutoCal's Next and Prev buttons, navigate to the "Read" option corresponding to your vehicles controller type and press Ok to begin retrieving the calibration file (If you get an $0280 or $0281 error, please click here or see below for error explanation). If your Read 1 option is L31, LS1A or LS1B or you have a manual transmission, then you have only one file to read. All others will need to perform both the Read 1 and Read 2 functions. Exceptions to this rule are all Allison equipped vehicles will need to perform the Read 2 option and all 2017 8 Speed vehicles will only perform the Read 1 option. Follow all on-screen instructions pertaining to ignition, percentage completed and wait times to ensure a successful read. If you see a File Sys Full error when doing this step, that means the Data log or the Data log and Engine/Transmission file have taken all the available space on the AutoCal. Plug your AutoCal into your computer and open the EFILive Explorer program. Then see below for the Copying Files To and From Your AutoCal step to transfer the files. When they are transferred, click on the Scan folder and delete the log file. If necessary, click on the Read folder and delete the engine/transmission file. This will free up space on the AutoCal for the remaining file(s). Using the AutoCal's Next and Prev buttons, navigate to the "Read" option corresponding to your vehicles controller type and press Ok to begin retrieving the calibration file (If you get an $0280 or $0281 error, please click here or see below for error explanation). If your Read 1 option is L31, LS1A or LS1B or you have a manual transmission, then you have only one file to read. All others will need to perform both the Read 1 and Read 2 functions. 8 Speed vehicles will only perform the Read 1 option at this time. You will receive an error $0552. That is expected. After getting that error, plug your AutoCal into your computer and open the EFILive Scan and Tune program. Click on F3: Tune and then in the window that pops up, click on F8: Authorization. Click on the Synchronize button and a locked Auth code will appear in the main window. Click on Auth Code and then click the Copy Code button. Create a new email to us at AutoCalTunes@BlackBearPerformance.com, paste that code into that email and send. That will allow you to paste in the code in an email to us. We will forward that code to EFILive to unlock it. We will then follow up by email once the code has been received on our end. In the lower pane, click on the "F3: Data Files". Within this section, the file tree will list "Scan", "Tune" and the sub-folder "Read". Scan corresponds to all logged data that has been created and saved to your AutoCal device. Tune corresponds to all tune files that can be programmed to the AutoCal via the 5 programming slots in the onboard menu. Once you copy files to the AutoCal, they will not be immediately visible. You will need to reboot the unit (unplug it and plug it back in) for the files to be visible in their respective "PROG" slots. Read corresponds to all tune files that have been retrieved from a vehicle using AutoCal's read function. 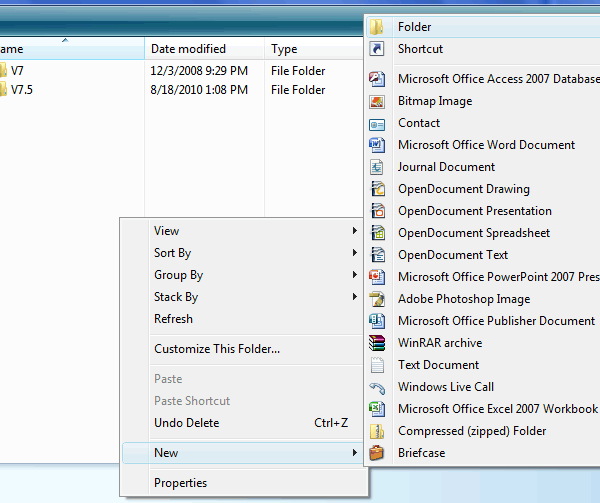 The upper window panes represent your PC's file structure, folders on the left, files on the right, and the lower pane represents the AutoCal. File operations within EFILive Explorer operate just as they do within Windows and allow for easy drag-and-drop copying. In the upper pane, navigate to your Tuning Files folder and drag the files to and from the AutoCal that you wish to move. Note: Some users have encountered drag-drop errors using Windows 7. If you find that you cannot drag the files to be installed, there is another option. Right click on the file(s) to be copied to the AutoCal and select "Copy", then right click in the AutoCal memory pane and select "Paste". Repeat this for all desired files. 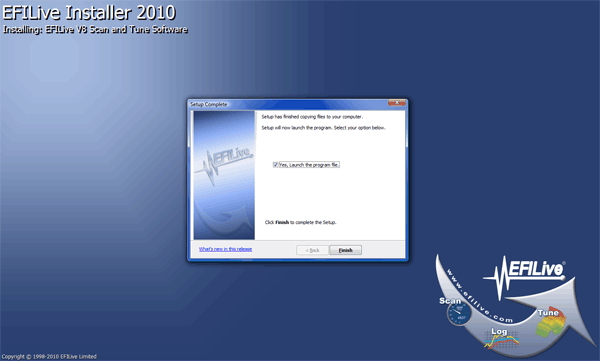 Connect your AutoCal to your PC via the provided USB cable and open the EFILive Explorer program. To transfer the log file, click on the Scan folder. Copy and paste, or drag and drop, the file to your Tuning Files folder in the upper pane. To transfer the tune file(s), click on the Read folder. Copy and paste, or drag and drop, the file(s) to your Tuning Files folder in the upper pane. Once those files are saved to your computer, please email them to us using the following instructions. Note: The "F4: Config Files" tab contains all files that AutoCal uses for vehicle connection and tune file retrieval. This memory is populated via the EFILive Scan and Tune program discussed previously and should not be altered. Once you have completed your initial data-logging and have retrieved your factory tune files, please draft an email to "AutoCalTunes@blackbearperformance.com". In the subject, please specify your vehicle year, model and engine as well as your name for purposes of file tracking on our end. Vehicle Modifications - please provide manufacturer model/part numbers when possible. Specific Areas of Concern - example: transmission slippage, rough idle, poor mileage, etc. Note: If you have any additional modifications planned in the near future, please include those in your request, as we will integrate them with the completion of your tune. We cannot regularly accommodate a tune update request for additional modifications immediately after completing your primary tune. Update/change requests are at no charge to you, and as a result, are completed at a lower priority than new tunes for other customers. Attach the desired files to the email and make note of any special situations regarding the logging conditions. We will analyze the log file(s) and either reply back with a request for action or confirm your desired tune changes and place you on the to do list. If you have a 2007 or newer vehicle and have ever used a Diablosport product at any time on your vehicle, even if it is not currently installed, please specify that when sending your tune files in. Very often, there are trace components of the tune left in that can cause your ECM to left blank when flashing, requiring additional work on our end and a no start condition on yours. Once completed, we will email the tune files for you to copy to your AutoCal and then install. And finally, after you have received your completed tune files, you will want to follow the steps below to program them to your vehicle. Please download and save the QS file to your computer from your email. Plug your AutoCal into your PC. Double click on the QS file. Once opened, you will be presented with the Quick Setup screen. Take the AutoCal and OBD2 cable out to your vehicle and plug them in. Turn the key to the run position but do not start the vehicle. Navigate to the Prog options corresponding to your vehicle's controller(s). Each controller will need to be programmed separately. The file name will be displayed under the Prog function. Do not use the FULL option unless specified by us. If your tune files have "ECM" and "TCM" in their names, you will want to program one ECM and one TCM file to the truck. For example, load PROG 1 89-87OctECM and then load PROG 3 ModTCM when equipped. Press Ok to begin the programming process (If you get an $0280 or $0281 error, please click here or see below for error explanation). If the vehicle has not yet been programmed, you will be requested to license the vehicle to the AutoCal. This will permanently lock the vehicle's controller to one of the available AutoCal licenses. Once programming has commenced, a status indicator will be displayed. Do not disrupt the programming process by touching the ignition key or disconnecting the cable until programming has completed. Upon completion, the AutoCal will notify you to remove your ignition key and will present you with a timer indicating the length of time you should have the key removed. Repeat the process as needed for a secondary controller (eg transmission). Do not install the stock tune file(s) after loading the custom tune file(s). That will override the custom tune files and put your vehicle back to factory settings. Your tune files have now been installed and your vehicle is ready to drive. Please collect a follow-up log file to be sent in and analyzed. Note: The 2007 and newer six speed automatic transmissions can be a bit unpredictable. We strive to deliver a consistent shift quality to all customers, however the mechanical inconsistencies of each transmission may pose a problem for that goal. If you notice any harsh shifting, up- or down-shift slipping or odd behaviour, please give the vehicle a day or two of learning before requesting an update. If shifting is EXTREMELY harsh or soft, do not hesitate to contact us right away for an update. A log file of the harsh or soft shift will be very beneficial in diagnosing the tune needs. Connect your AutoCal to your PC via the provided USB cable and open the EFILive Explorer Utility. Please download and save the COZ/CTZ file(s) to your Tuning Files folder. In the upper pane(s), navigate to your Tuning Files Folder. In the lower pane, click on the "F3: Data Files". To transfer the tune file(s), click on the Tune folder in the lower pane. Copy and paste, or drag and drop, the file(s) from your Tuning Files folder in the upper pane. Below are a list of some of the most commonly used file names and basic descriptions associated that we will provide for customers. "ECM", "TCM" - Refer to Engine Control Module and Transmission Control Module respectively. Those vehicles with separate computers for each will have separate tune files for each which must be programmed independently. StockTune, StockECM, StockTCM - All refer to OEM factory tune files. To revert to factory configuration, program all files with "Stock" in the name onto the vehicle. 89-87OctECM - Engine computer tune designed for optimal use with 89 or in some cases 87 octane as well. 91+OctECM - Engine computer tune designed for 92-93 octane with acceptable operation on 91 octane as well. ModTCM - Transmission computer tune designed for all around shift patterns and response improvement. Tow/haul shift functions will remain unaltered on truck platforms. SportTCM - Transmission computer tune designed for more aggressive shift patterns and response. On 4 speed trucks, this is primarly accomplished on the tow/haul option only. EconTCM - Transmission computer tune designed for more economical shift patterns. Throttle response may suffer as a result. 89-87OctTune, 91+OctTune, ModTune - Vehicles with a single engine/transmission computer with standard shift pressure/response improvements. Tow/haul shift functions will remain unaltered on truck platforms. 89-87OctSport, 91+OctSport, ModSport - Vehicles with a single engine/transmission computer with more aggressive shift pressure/response improvements. On truck platforms, this will take place of the tow/haul shift pattern. Error codes $0280 or $0281 indicate a problem with the communication with the vehicle. Please check to ensure that the key is in the correct position at the time of action. If you are collecting the factory tune files, please ensure that the key is on and the engine is off. If collecting a data log, disconnect the AutoCal, start the vehicle and attempt to record again. Also, please ensure your cigarette lighter is not blown. If you have any aftermarket electronics, please remove the radio fuse. If you have a remote start, please contact us. Error code of $0194 while copying files to the AutoCal indicates that the internal memory is full. With the 6MB limit, you may not be able to store all of the files pertaining to your vehicle on the device at one time. Delete all logged data and try again, copying only the files immediately necessary. Error code of $050B indicates that the AutoCal's configuration is not correct for the file needing to be flashed. Please update the firmware on the AutoCal using the Initial Setup Instructions and then re-load the QS file using the Configuring AutoCal step. Error code of $0185 while recording data or reading tunes from the vehicle often indicates that the AutoCal's internal memory structure needs to be re-built. To do this, format the device using the "Format File Sys" option on the AutoCal menu. Error code of $0536 while attempting to program indicates that the tune file has not been registered by our equipment for your device. This can occur is you are trying to reload your original OEM tune files rather than the "Stock" file(s) we provide, or it can occur when a tune file has been corrupted slightly, frequently by an email service. If you are able to re-download the file from your email, please try that. If that does not work, simply send an email in requesting your tune file for a $0536 error. Error code of $0537. This either means that the PCM/ECM is locked or the configuration is incorrect. Please send in an email to us if you see this error for our diagnosis. In most cases, your software drivers will install automaticially. In some cases, Windows does not recognize the software driver for the AutoCal automatically and you will need to do that manually. We've outlined the basic steps below. Plug the USB cable into your laptop and the flashscan device. Go to your start menu, then control panel. Click the "switch to classic view" link in the left pane, then click System. If you're using Vista, click the device manager link in the left window. If XP, go to the hardware tab, then click device manager. Look for the EFILive cable entry. Right click on it and select "Update Driver". When prompted, do not have windows search Windows update for a driver. Take the advanced option when offered and browse a specific location. Browse to C:\program files\EFILive\Drivers\EFILive\win-2k-xp-vista (or similar location) and click continue. If prompted regarding windows logo testing, click to continue anyway. Once completed, the cable should be ready to use. Please be sure to read through all steps before contacting us with a questions or issue. If after attempting to configure the AutoCal, you are unable to proceed, we will be happy to help by offering a remote desktop support solution to allow us to configure and set up the unit for you. 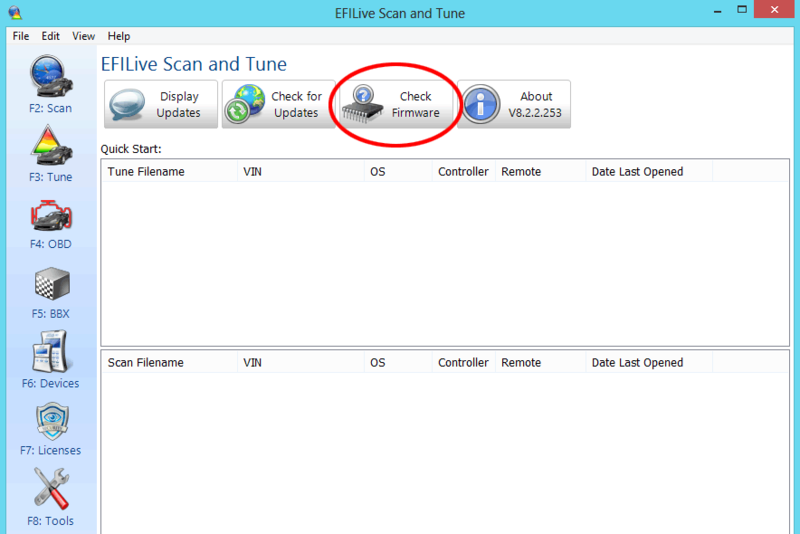 Ensure that you have the most up to date EFILive by comparing the EFILive V8 version and build number in the Scan and Tune program's home screen to what is shown at www.EFILive.com. When the firmware is updated, EFILive often releases new software and/or programming features which will require the unit's configuration to be updated prior to use. To easily update that configuration, open the Scan and Tune program and click the BBX button. Press the "Read" button to retrieve the AutoCal's current configuration options, which will be re-used. Next, click the down arrow attached to the Program button and select the "Format CONFIG File System" option. Once that process has completed, Press the Program button itself and press Yes when prompted to proceed. Your AutoCal should now be fully updated. If you see an "OPTIONS MISSING" message when you plug the AutoCal in, please refer to the Configuring AutoCal for logging and file retrieval step. Each AutoCal ships with one tuning license available out of eight possible. If you have another applicable vehicle that you would like to tune, we would be glad to provide that service to you at a cost of $325 ($385 for 2017+ models) for both license and tuning for existing BBP AutoCal owners. If you have an AutoCal from another tuner, then the same service can be provided at a price of $385 ($445 for 2017+ Models) for the tune and license. To proceed, all that is needed is the information below. Connect your AutoCal device to your PC. Click on the Licenses button. The Serial Number will be shown at the top of the F2: Hardware screen. The serial number can be found on the AutoCal itself as well. The Authentication (Auth) Code will be shown in the Auth code: field under the F3: VINs screen. We are presently not offering any diesel tunes for customers. Sorry for the trouble.